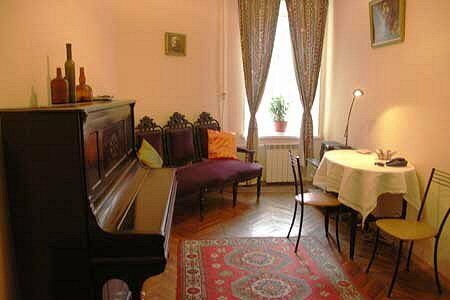 A beautiful and quiet 1-bedroom apartment in romantic style, which bears elements of an interior of the 19th century. A living-room of 20 m², a bedroom of 20 m², a hall with mini-kitchen of 9 m². The apartment is located on the 3st floor, with an elevator. The entrance directly from the street through the on-door speakerphone. There are parking places near the house. A guarded parking is withinf 7 minutes walk. The apartment sleeps up to 2 guests (a queen-size bed in the bedroom). An additional sleeping place via the stareway is available. Amenities include colour TV, Wi-Fi Internet, telephone, refrigerator with a freezing chamber, microwave, kitchen accessories, toaster, washing machine, radio tape recorder, hydromassage.